In English law, a biscuit goes soft as it gets stale, and a cake goes hard. This was established during the great Jaffa Cake case. Sometimes these things need to be decided in the courts. This is what legal systems are for - it's comforting to know that the system works. Peter Kay would have known the difference between a cracker and biscuit - that I'm certain of. Wikipedia easily solves the debate in your favor, Ed! "TUC is a brand of snack biscuit available in Europe, Asia, North America and North Africa. The biscuits are octagonal in shape (like a rectangle with the corners cut off) and are golden yellow in colour." Wikipedia, Google and smartphones have killed that kind of debate though, Evi. It makes me a little sad; there's nothing better than a good wrangle over the differences between stuff, like ... I don't know ... a street and a road. Hey! What *is* the difference between a street and a road? Anyone up for a pointless argument? Ed, you really need to get over it! It's my only deadly sin! Evi .... I have never had the bacon flavour ones..... I'm with you though I would love them too. Never! I'm a small and petty man, T, and I will rebake this victory with every word I can - cake, cookie, cracker ... umm ... I'm sure there are more anyway. And, after that, if I have any readers left, I might just initiate my own legal case to have the differences between them established by law. So there. What a blog that would be! And now I fancy a biscuit, but we haven't got any in the house. I live in Texas, so I have MUCH different ideas about such things. A biscuit is light, often flaky, bread-like, and generally round, but sometimes hexagonal. They are buttery-tasting, although people have been known to add cinnamon to them. Cookies are round, sweet, cake-like confections that can range from crisp to soft. Crackers are crispy pieces of a grain-based substance (e.g. wheat, graham) with a wide variety of flavors. I bet you have! 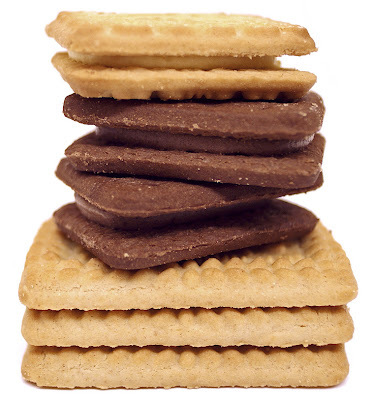 When I was younger, I spent a lot of time reading books set in England and, occasionally, Ireland, therefore becoming acquainted with the English definition of "biscuit" earlier in life than most Americans. Especially considering a lot of Americans don't know that there's a difference anyhow. I also love the word confection. It's a picture-painting word. Yes, English and Irish literature has done much to spread awareness of our particular cultural and linguistic oddities, although we don't all love crumpets and tea. Well, we do a bit. Actually we do - every last one of us - there's nothing more delicious in the world!